There are 5.43 pounds of olives in my refrigerator I can somehow correlate to an impromptu Costco trip. Why the heck I thought buying so many olives was a good idea is beyond me, but maybe I’ll live off tapenade for the next month. If a person turns orange from eating too many carrots, can one turn purple from too many olives? I could live off this stuff! Oh wait, I am. Mince garlic in a food processor. Add the rest of the ingredients and pulse until olives are finely chopped. Taste and adjust seasonings if needed. Oooo I love carby scooping devices. Turn grill to high. Lightly brush sliced bread on one side with olive oil. Place oil side down and grill until toasted. 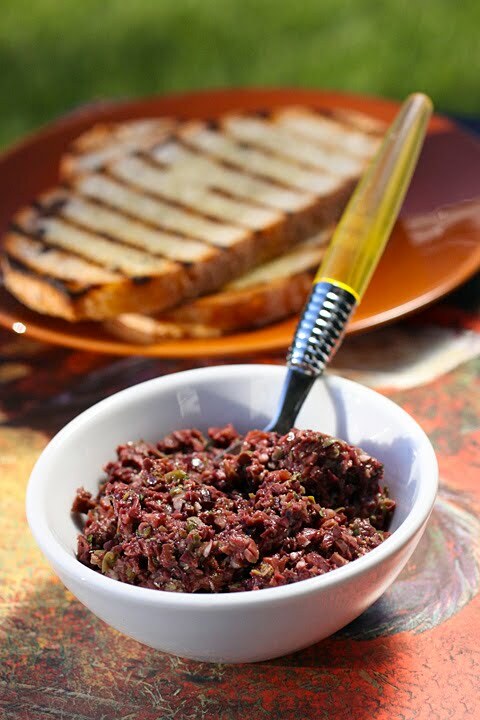 Move to a serving plate and top with luscious tapenade. Shovel into mouth before someone insists you share. Recipe & photograph by Laura Flowers. I love impromptu Costco trips and impulse buys...and all the delicious food that comes out of them! I wish I belonged to Costco...you can get some great deals. This tapenade looks great. My husband ADORES olives, so this would be perfect. You are always so adventurous in the kitchen! Kalamata are my favorite olives BY FAR! I'm sure this spread is heavenly! Have a great weekend, Laura! I love the saltiness of a good tapenade. It contains all of my favorite brined ingredients... I made some last year with some marinated artichoke hearts blended in...it made for a great sandwich spread! I know all about tapenade, but sometimes I need to be reminded about how good it is, which then prompts me to make some. Thanks for the photographic reminder! LOVE Costco! Your picture is great. There are never too many olives, i thought i was bad, buying 1 pound twice a week.. LOL! 5 lbs?? HAHAHA! You rock! Thanks Steph. I love shooting in high contrast light. It's my favorite. I've got a large jar of kalamata olives from Costco in my fridge too. This looks like a great way to use up some of it. I hate to think about how much of this I will eat on little baguette slices. Oh, how I love tapenade! I don't care if it turns me purple, I could eat it night and day :) I particularly love it as a sandwich spread. I am finally enjoying olives. It took me quite a while to develop a taste and I'm so glad my taste buds finally came around cause right now I'm drooling!